Is there a way of getting the analysis "create fishnet" to generate a grid of x number of points in ModelBuilder? For example, I wish to generate a grid consisting of for example 80 points within a polygon (see picture). However, also as per its documented Syntax, there is no option to provide a clipping/selecting polygon that restricts creation of label points within its boundary. As a workaround you could decrease/increase the distance(s) between fishnet points until, when clipped with your polygon, they number exactly 80. To automate that process would require using ArcPy (with a for loop) or a ModelBuilder model (with an iterator). Not the answer you're looking for? Browse other questions tagged arcgis-desktop modelbuilder arcgis-10.5 vector-grid or ask your own question. Using Model to equally distribute points, spatially within known geometry using ArcGIS ModelBuilder? How to create random points outside polygons? 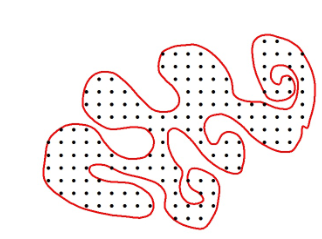 How to fishnet many individual polygon features at once using each feature's extent? Understanding extent used by ArcGIS Create Fishnet?